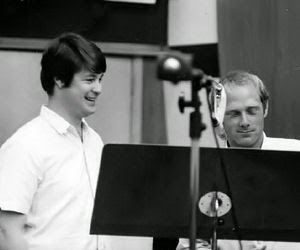 THE BEACH BOYS WERE A HIT IN THE SIXTIES TOO ! 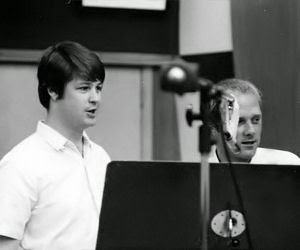 Paul McCartney has called Brian Wilson's ' GOD ONLY KNOWS ' his favorite song of all time. In an interview in 1990 he stated " It's a really, really great song — it's a big favorite of mine ". I didn't think long and hard on it but I popped that God Only Knows is on the top of my list. It's very deep. Very emotional, always a bit of a choker for me, that one. There are certain songs that just hit home with me, and they're the strangest collection of songs ... but that is high on the list, I must say God Only Knows' lyrics are great. Those do it to me every time. " 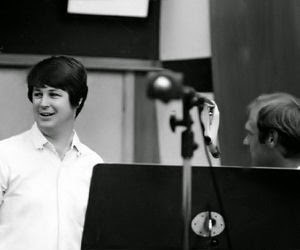 Each of the black-and-white pictures below of the young Brian Wilson ( at that time 24 years old! ) is separately clickable and performs once again the unique studio tape recordings from that era. Speaking on a special Radio 1 show, McCartney said: " 'God Only Knows' is one of the few songs that reduces me to tears every time I hear it. It's really just a love song, but it's brilliantly done. It shows the genius of Brian. I've actually performed it with him and I'm afraid to say that during the sound check I broke down. It was just too much to stand there singing this song that does my head in and to stand there singing it with Brian." Referencing this, Brian responded apprehensively in the 1970s: " Like, if 'God Only Knows' is the greatest song ever written, then I'll never write anything as good again! And if I never write anything as good, then I'm finished." but long as there are stars above you. I’ll make you so sure about it. though life would still go on believe me. The song has been recorded by numerous artists including Glen Campbell, Andy Williams, Neil Diamond, David Bowie, Joss Stone, Olivia Newton-John, Andy Moore, Michael Stipe, Weezer's Rivers Cuomo, Dale Earnhardt Jr. and Taylor Swift. On October 7, 2014 a BBC Music show performed " God only knows " again, but in my opinion it was just a dreadful spectacle finished by the maestro Brian Wilson himself. See all the participating celebrities, like Pharell Williams, Elton John and Stevie Wonder, supported by 80 musicians of the BBC Concert Orchestra HERE ! Judge and listen for yourself HERE . Article from MY FORMER SPIDERSWEB.NL website.